This is, in fact, the easiest and most delicious chestnut stuffing ever. I made it up, so determine quantities and proportion to your liking. I swear, it really doesn’t matter. “This is the stuffing from now until infinity,” my husband pronounced on Thanksgiving. Saute onions, mushrooms in butter until almost cooked. Add small apple chunks and mix. Cook a little more. Mix in cooked chestnuts. Roasting chestnuts in the quantity I use for stuffing is too big a pain. I use chestnuts in a jar, or you can use the ones that come in a refrigerated package. The jars appear at Whole Foods before Thanksgiving and disappear really quickly during the season. I buy in quantity, because we love them as snacks, too. Trader Joe’s sometimes has the refrigerated packaged chestnuts. Roast if you want, but I don’t do that for stuffiing. Put dry herbed stuffing mix in a big bowl. I buy a bag of it and since it’s already herbed, well, it’s easy. Add the sauteed mix to the stuffing mix and combine well. The stuffing mix package tells you how much broth to use; I used a little more, maybe two cups. You’ll know when it’s the right consistency. Transfer to the right sized baking dish after you’ve sprayed it down with Pam. Bake at 350 degrees for about 30 minutes or until apples are cooked. That’s it. Easy chestnut stuffing. I’m telling you, it is delicious. I wish I liked chestnuts but I don’t. It is the only nut that I don’t care for and it has haunted me my whole life. Skating as a kid, there was a chestnut roaster vendor and as a tween and teen to have someone buy you some fresh hot chestnuts was a big deal! Smounds delicious. I’m going to try it. My holiday wrapped up last evening but the husband’s holiday starts oh too soon :-). Oh Carol, you temptress, you! Yum!! This sounds delicious. I love chestnuts and I can’t wait to try this. I would have never of thought of chestnut stuffing. Different for sure and it sounds amazing Ill have to try it out. This is very similar to my recipe. I love it! We will be having it for Christmas. this looks like that it really lives up to its title – it’s easy – and it looks SO good! this recipe looks like its title – easy enough to do – and it looks SO delicious too! Any recipe that contains “a stick of butter” has to be a winner! I associate chestnuts with the roasting aroma on Manhattan corners in the winter. But I’ve never cooked with them before. Maybe now’s the time to try. God knows, I can eat stuffing straight through to Easter! I love Chestnuts so much that they would never make it into the stuffing…. but I’ll get my husband to cook this, then it’ll have a chance. That looks amazing! I’m pinning it so I’ll have it for later. I tried a new version because I was only making it for a side dish for my brother’s dinner. I found it on Pinterest and I wanted it because it was a slow cooker version and it was delicious as well. I’ve only fixed my mom’s, but its nice to try new things. I so love chestnuts! On its own or if it’s part of a wonderful recipe, I don’t really mind. Thanks for sharing this recipe! I’ve been wondering where to get roasted chestnuts, so I’m so glad you told us. This sounds pretty fabulous! I have never seen a recipe for chestnut stuffing before. I’ll have to bookmark this one. Sounds delicious… I will follow steps and will try to make it in my kitchen!! I’ve never had a Chestnut, which is so surprising when I think about it! The recipe looks yummy, Carol. Thanks for sharing! I honestly don’t think I’ve ever really tried chestnuts. Which is weird, since I lived most of my life in NY and they roast ’em on the streets there! Andrea B. recently posted…Sit Down And Write, Even When You Have Nothing To Say. Though I love it, I have never thought of chestnut stuffing before. But it looks like a delicious choice to go ahead & I would love one such recipe for Christmas. I honestly haven’t tried any form of chest nut dressing in the past but this seems quite easy and a good combination to try out. I’m not a huge chestnut fan but might give this a whirl for the Christmas turkey. The family in Italy love them. Sound yummy. I did roast chestnuts a long time ago and they were delicious. I didn’t know you could buy them refrigerated or in a jar. I must try them and this recipe. yes totally agree ; my mom made this. Never added apple though. I like a shallot sauteed in there too. I also like cornbread stuffing instead of bread. Just the mention of chestnuts and stuffing puts me in the holiday mood! Rosemond recently posted…National Adoption Month. 4 adoption resources for families considering adoption. 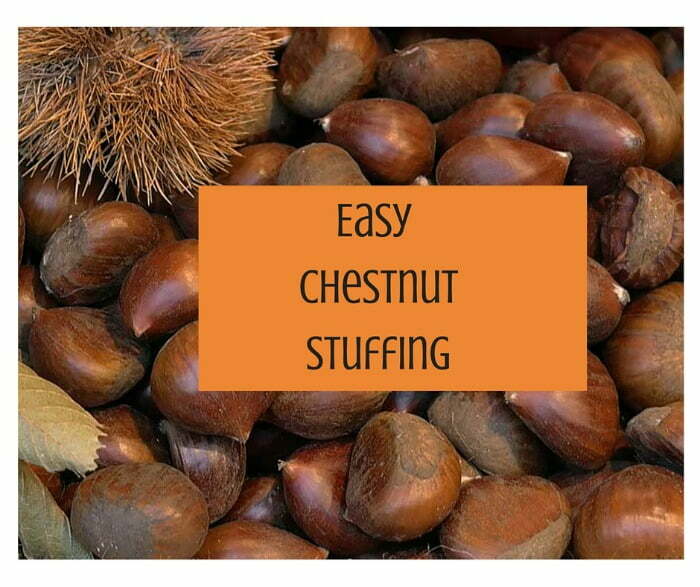 Sounds lovely – I love stuffing (& chestnuts)! This sounds delicious! My husband is a stuffing addict so we will have to try this! What a delight! Easy Chestnut Stuffing! I have to try this! Perfect for the holidays! This is the first time I am hearing about this and my mouth is just watering! I love chestnut and stuffing so I can only imagine what this would be like. Thanks for sharing!! This sounds SO good. Need to try this recipe out this weekend! Oh yum, I could definitely go for this. Pinning it and can’t wait to try it. OOo this sounds awesome! I am a huge fan of stuffing. Amber Myers recently posted…Why Do Others Make Fun Of People With Autism? yummyyummy chestnuts are delicious! especially when served savory! I’m sure it is delicious! oow this is very interesting. Something to be made for next Thanksgiving. This is so festive! Chestnuts are a staple during the Holidays and it would be awesome to have this stuffing on the Christmas table along with the other dishes! It’s really nice! My mom loves to eat chestnuts and this one is very easy.. Thanks for sharing your awesome recipes. This sounded so good that I pinned it so I could make it for Christmas dinner. Thanks for a great new recipe to try. Looks finely delicious! So starving with this chestnuts really like these especially if this chestnuts roasted. Can’t wait to try this! I will follow this recipe and make this. So looks delicious. Looks so good! Really like eating chestnuts especially with my family! Really love it! I have never tried chestnuts before. ’tis the season though, so I will keep a look out! Omg can we say yum?!?! I must give this a try!!! This sounds delicious. I’ve been working on a new gluten free stuffing recipe that I can’t wait to try on the family. That is one of the most simple chestnut stuffing recipes that I have ever seen! I bet it tastes fabulous, especially with the apples. I love apple and chestnuts as flavor combinations.